Whether you’re investing in experiential store concepts or extending e-commerce capabilities, one thing is for sure—the retail industry is undergoing a serious evolution, driven by the unique demands of today’s consumer. It’s never been more important to have whatever the consumer wants on the shelf (digital or physical) at the exact time that he or she needs it. Supply chain data exchange needs to come up to speed to effectively support these new innovations—instead of overburdening the traditional supply chain model with more demand. This challenge was one of the driving forces behind a year-long study recently completed by the Auburn University RFID Lab in partnership with GS1 US. For the first time, we compared the flow of product shipment information between brands and retailers, analyzing the efficiencies when using Electronic Product Code (EPC)-enabled item level radio frequency identification (RFID) versus legacy systems based on U.P.C. (Universal Product Code) barcode scans. The “EPC/RFID Retail Supply Chain Data Exchange Study” also was called “Project Zipper” within the industry, reflecting the ubiquitous zipper as a metaphor for the interdependence between brands and retailers. The team sought to confirm a hypothesis that RFID would lead to improved order accuracy supported by years of research. Since 2005, the RFID Lab has produced groundbreaking reports on RFID technology, verifying its use cases in many types of environments. In retail, RFID used at the item level can lead to many benefits for both brands and retailers, such as decreasing out-of-stocks, improving loss detection, streamlining the returns process, and boosting sales margins. RFID is also increasingly becoming the power behind new fulfillment methods, such as buy online/pick-up in store and ship from store, helping consumers and sales associates pinpoint exactly what’s available in real time. 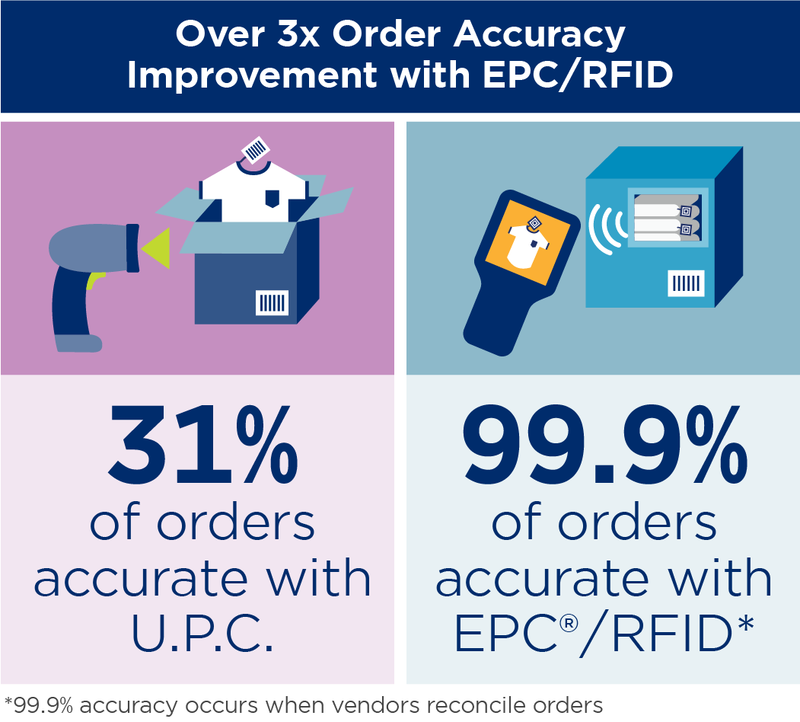 Measuring a sample of more than 1 million items from five leading retailers and eight brand owners, we found that brand owners and retailers using item level RFID to optimize inventory management and reconcile product shipments are capable of achieving 99.9 percent order accuracy. The study also found that when RFID was not implemented, 69 percent of orders shipped and received from brands to their retailer partners contained data errors. These errors were revealed in picking, shipping, and receiving, resulting in inventory inaccuracies and costly chargebacks and claims from the retailers to the brand owners. The number of errors was much higher than expected. We did not expect nearly 70 percent of the orders to contain a discrepancy between the brand and the retailer regarding what was shipped—the team estimated about half of that would be the result. However, given the fact that supply chain data accuracy processes have been relatively unchanged for decades, while demand on the supply chain increases, it’s no wonder errors occur at this rate. Typically, a retailer issues a purchase order, then a brand picks and packs the specific goods for that order, sends an advanced shipping notice, and ships the items. Upon receiving the order, the retailer reconciles what is received against the order. If there is a perceived error, it sends a claim against the brand. With today’s extremely high expectation for speed, seemingly small errors (such as a SKU count being over- or under-estimated), can happen more frequently and have more of a negative impact on the brand/retailer relationship downstream. The acceptance of errors as just a reality of doing business. It was surprising just how much industry as a whole has accepted errors and worked around them, adding time and money unnecessarily. If the error is even acknowledged at all, many companies have built tolerances into their systems which are then perpetuated. Rarely is there time to go back and look into the root causes or change process to avoid them in the future. For example, a telephone conversation between two trading partners working to agree on new quantities of a shipment may never be recorded into the company’s system. However, when RFID is used, all supply chain partners have visibility into where an item is and what’s contained in a shipment. Chargebacks and claims are the expensive consequences of errors and workarounds and can effectively be eliminated with RFID because it helps maintain SKU-level order accuracy from beginning to end. The data for each uniquely identified RFID tag on a product links that item to a specific order. During Phase 2 of Project Zipper, set to be completed in mid-2019, our team will investigate further into how workarounds occur and how RFID can help alleviate the resulting confusion before it even starts. Being “tag ready” versus fully using the data. While tagging items can fulfill a retailer requirement, few brands are taking the opportunity to leverage RFID to truly optimize inventory and save money. Part of the reason is that order data on the brand side had not been previously examined until now. For many years, the RFID conversation has been focused on the retailer, specifically the store setting. 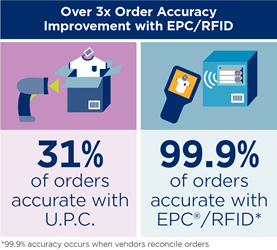 The study clearly demonstrates the benefits to using RFID from source to store and underscores the need for standards to share the EPC data being scanned. Take for instance, the 99.9 percent order accuracy finding—this illustrates the industry’s tremendous potential for improved collaboration. For the brand owners who use RFID to capture information and reconcile shipments, only one order contained an error. Isolating just the last 10 months of the study, there were no errors, proving that 100 percent reconciliation between brand and retailer is possible. These partners experience zero retailer claims—that’s thousands, maybe millions, of dollars in savings. Add this to being able to reduce the amount of safety stock, and the industry could be maintaining significantly healthier bottom lines. In summary, the study helps prove RFID’s return on investment for both the brand owner and retailer sides of the supply chain. RFID can help brands eliminate costly chargebacks and claims, streamline order shipping processes, and pinpoint the exact locations of their goods. Retailers are able to nearly eliminate the frustration of working through incorrect shipments and ultimately allow innovative store concepts to flourish by optimizing inventory levels. Justin Patton is Director of the Auburn University RFID Lab, home to the ARC program, which is the most widely used program for validating RFID tag performance and quality globally. For more information, visit https://rfid.auburn.edu/.